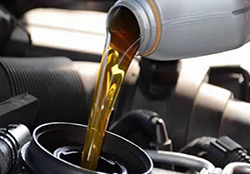 Motor oil, engine oil, or engine lubricant is any of various substances comprising base oils enhanced with additives, particularly antiwear additive plus detergents, dispersants and, for multi-grade oils viscosity index improvers. In addition to that, almost all lubricating oils contain corrosion (GB: rust) and oxidation inhibitors. Motor oil is used for lubrication of internal combustion engines. The main function of motor oil is to reduce friction and wear on moving parts and to clean the engine from sludge (one of the functions of dispersants) and varnish (detergents). It also neutralizes acids that originate from fuel and from oxidation of the lubricant (detergents), improves sealing of piston rings, and cools the engine by carrying heat away from moving parts. Motor oils today are blended using base oils composed of petroleum-based hydrocarbons, that means organic compoundsconsisting of carbon and hydrogen, or polyalphaolefins (PAO) or their mixtures in various proportions, sometimes with up to 20% by weight of estersfor better dissolution of additives.